Home » » Registration for Bright Hill Winter/Spring Literary Workshops for Kids & Bright Kids Book Club Open Now! Registration for Bright Hill Winter/Spring Literary Workshops for Kids & Bright Kids Book Club Open Now! Treadwell, NY - Bright Hill Press & Bright Hill Literary Center of the Catskills, located at 94 Church Street, Treadwell, NY, announces its 25th annual Winter Literary Workshops for Kids Program and its Winter/Spring Bright Kids Book Club meetings. 1. "UNDER & OVER THE FROZEN WORLD: NORDIC SCIENCE, STORIES, & POEMS IN THREE DIMENSIONS" - Special Middle-School and Grades 9th & 10th Program - Three Saturdays - 9 am - 2:30 pm, Feb. 3, 10, & 17. We will read and study ancient Norse Mythology, including the tales of Odin, Thor, Loki, Freya, and Yggdrasil, the Tree of life. Students will write their own legends and design and build, with the 3-dimensional printer, creatures and characters. On the last day we will present our projects to parents and friends. The cost is $90. Registration is limited to 12 students. (Delaware Academy students, full scholarships; full and partial scholarships for Delaware and Otsego County students). 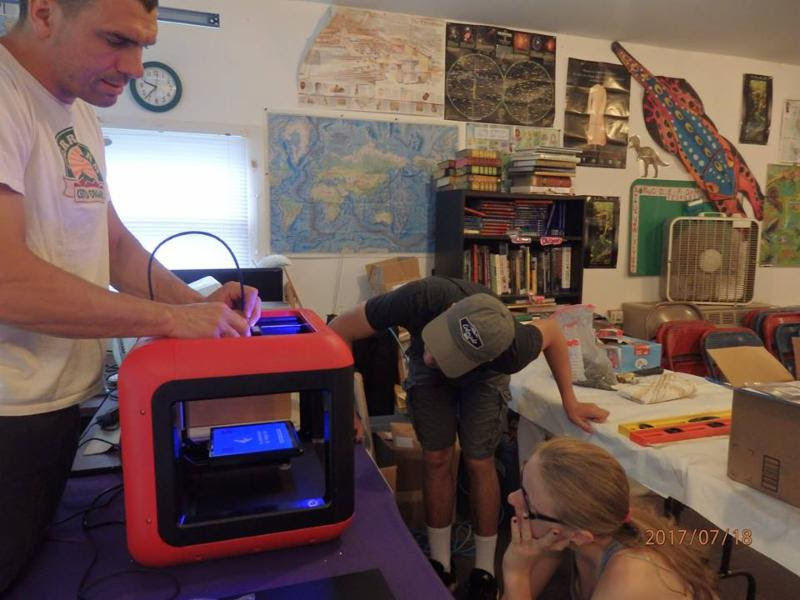 Workshop Kids Learning How to Use the 3-D Printer. 2. "BIRDS & BEASTS IN THE CATSKILLS WINTER: HOW DO THEY DO IT?" - Ages 6 - 14 - Five consecutive days, Feb. 19 - 23, 9 am - 2:30 pm. We will learn about the animals and birds that live in the Catskills in the winter, including how they survive in harsh conditions. We will take walking trips around Treadwell to find tracks and other signs of winter life, then make kinetic toys: zoetropes, phenakistoscopes, and praxinoscopes with stories, poems, and riddles about the creatures. On the last day we will present our projects to parents and friends. Cost: $120 (Delaware Academy students, full scholarships; full and partial scholarships for Delaware and Otsego County students). 3. 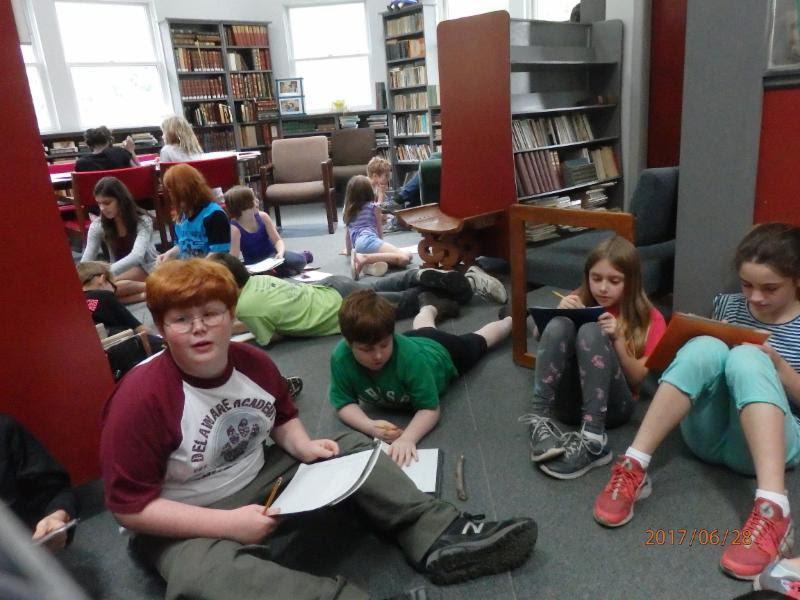 "BEOWULF & OTHER ANGLO-SAXON TALES & RIDDLES FOR TODAY" - Ages 6 - 14 - Five consecutive days, March 26 -30, 9 am - 2:30 pm. We will watch a Beowulf video based on Bertha Rogers's translation and production of Beowulf (the only epic poem in Anglo-Saxon), then choose characters (Beowulf, Grendel, the dragon, etc.) and objects (swords, shields) to study and create in words, papier mache, and pop-ups.We will learn to recite excerpts from the Beowulf epic in Anglo-Saxon and present our projecs and recitations to parents and friends. Cost: $120 (Delaware Academy students, full scholarships; full and partial scholarships for Delaware and Otsego County students). Registration is now open for all three workshops; for registration forms, click here.. All Bright Hill Literary Workshops include a focus on S(science), T(technology), E(engineering), A(arts), and M(mathematics); and include writing and visual arts, as well as use of the Bright Hill Community Library and BHLC SMARTBoard. Children ages 6-14 are eligible for Workshops 2 & 3; middle-school and 9th and 10th grade students are eligible for the "Under & Over the Frozen World" program. Workshops are led by Bertha Rogers, Master Teaching Artist. There is a fee, but Bright Hill also offers full and partial scholarships to permanent residents of Delaware and Otsego Counties. For registration forms and more information click here or call 607-829-5055, write to BHC, 94 Church Street, Treadwell, NY 13846, visit the organization's website, Bright Hill Press or e-mail Bright Hill at wordthur@stny.rr.com. 4. BRIGHT KIDS BOOK CLUB is open to students 3rd grade - 7th grade; it meets 2nd and 4th Saturdays from fall through late spring at Bright Hill, weather permitting. Curator is Lorinda Morgan, assisted by Jennifer Potrzeba. Bright Hill's 2018, 26th anniversary programs are made possible by grants from the New York State Council on the Arts with the support of Governor Andrew Cuomo and the New York State Legislature; Otis A. Thompson; A. Lindsay and Olive B. O'Connor; A.C. Molinari; Dewar, and Tianaderrah Foundations; Stewart's Shops; the Abraham Kellogg Education Fund; the Delaware Youth Bureau, through the auspices of the New York State Office of Children and Family Services; the Delaware National Bank of Delhi, Delaware County Office of Economic Development, and with the support of Bright Hill's members and friends. Bright Hill's facilities include the Bright Hill Community Library, home to more than 12,000 books and literary and art periodicals that may be borrowed by local residents; the complete catalog is online. The NYSCA Literary Map of new York State and The NYSCA Literary Tree.Â The organization and library are located at 94 Church Street, Treadwell, NY 13846. Contact 607-829-5055 or wordthur@stny.rr.com for more information.